Aoraki/Mount Cook National Park is in the South Island of New Zealand near the town of Twizel. 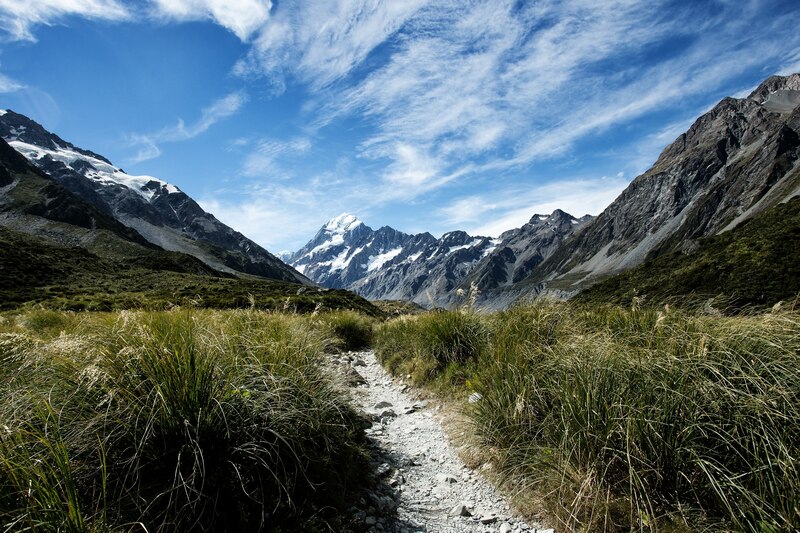 Aoraki/Mount Cook, New Zealand's highest mountain and Aoraki/Mount Cook village lie within the park. The area was gazetted as a national park in October 1953 and consists of reserves that were established as early as 1887 to protect the area's significant vegetation and landscape. 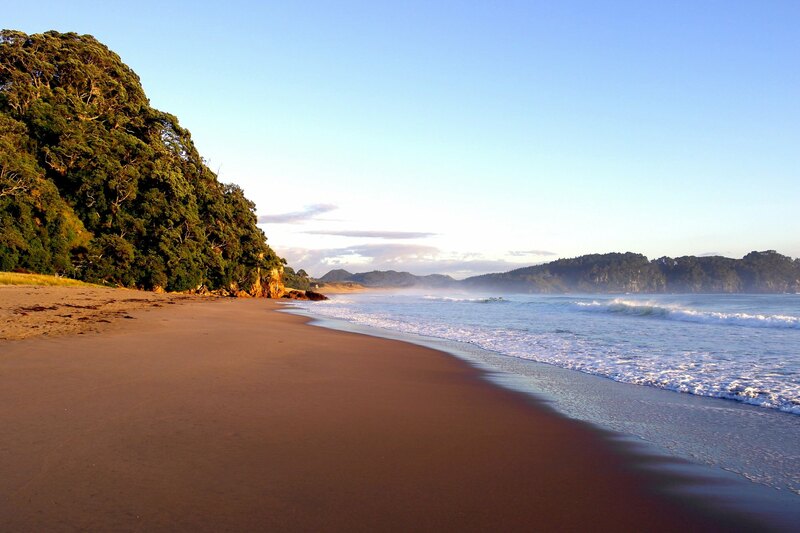 The Coromandel Peninsula on the North Island of New Zealand extends 85 kilometres north from the western end of the Bay of Plenty, forming a natural barrier to protect the Hauraki Gulf and the Firth of Thames in the west from the Pacific Ocean to the east. At its broadest point, it is 40 kilometres wide. Almost the entire population lies on the narrow strips along the Hauraki Gulf and Bay of Plenty coasts. In fine weather the peninsula is clearly visible from Auckland, the country's biggest city, which lies on the far shore of the Hauraki Gulf, 55 kilometres to the west. The peninsula is part of the local government areas of Thames-Coromandel District and the Waikato Region. The Coromandel Peninsula was named for HMS Coromandel (originally named HMS Malabar), a ship of the British Royal Navy, which stopped at Coromandel Harbour in 1820 to purchase kauri spars and was itself named for India's Coromandel Coast. The peninsula is steep and hilly, and is largely covered in temperate rain forest. The Coromandel Range forms a spine for the peninsula rising to nearly 900 metres, and the large island of Great Barrier, which lies beyond the northern tip, can be thought of as an extension of the range. Great Barrier is separated from Cape Colville on the peninsula's northern coast by the Colville Channel. 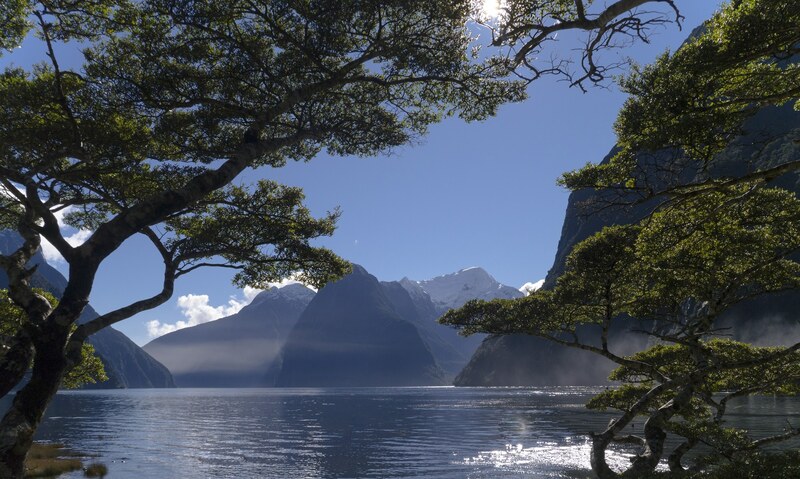 Milford Sound (Māori: Piopiotahi) is a fiord in the south west of New Zealand's South Island, within Fiordland National Park, Piopiotahi (Milford Sound) Marine Reserve, and the Te Wahipounamu World Heritage site. It has been judged the world's top travel destination in an international survey (the 2008 Travelers' Choice Destinations Awards by TripAdvisor) and is acclaimed as New Zealand's most famous tourist destination. Rudyard Kipling had previously called it the eighth Wonder of the World. Mount Tongariro (/ˈtɒŋɡəˌrɛ.roʊ/; Māori pronunciation: [tɔŋaɾiɾɔ]) is a compound volcano in the Taupo Volcanic Zone of the North Island of New Zealand. It is located 20 kilometres (12 mi) to the southwest of Lake Taupo, and is the northernmost of the three active volcanoes that dominate the landscape of the central North Island. Mount Tongariro is part of the Tongariro volcanic centre, which consists of four massifs made of andesite: Tongariro, Kakaramea, Pihanga, and Ruapehu. The andesitic eruptions formed Tongariro, a steep stratovolcano, reaching a height of 1,978 metres (6,490 ft). 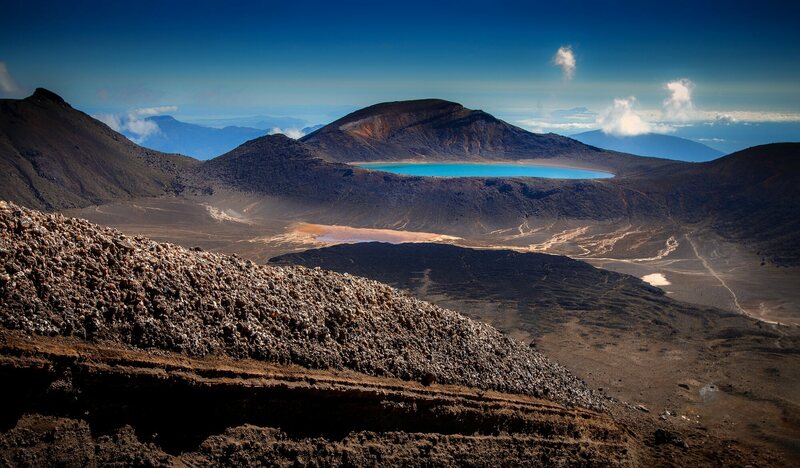 Tongariro is composed of layers of both lava and tephra and first erupted 275,000 years ago. Te Whanganui-A-Hei (Cathedral Cove) Marine Reserve is on the Coromandel Peninsula in New Zealand covering an area of 840 hectares (2,100 acres). Cathedral Cove is named after the cave located there, linking Mare's Leg Cove to Cathedral Cove. Gemstone Bay and Stingray Bay are also located within the reserve. A walking track exists from the northern end of Hahei Beach, and it is also possible to walk from the local authority car park at the top of the headland between Hahei and Gemstone Bay. The area is very popular with tourists, and receives around 150,000 visitors per year. Boat and kayaking tours come from Whitianga in the north and Hahei in the south to visit the area. 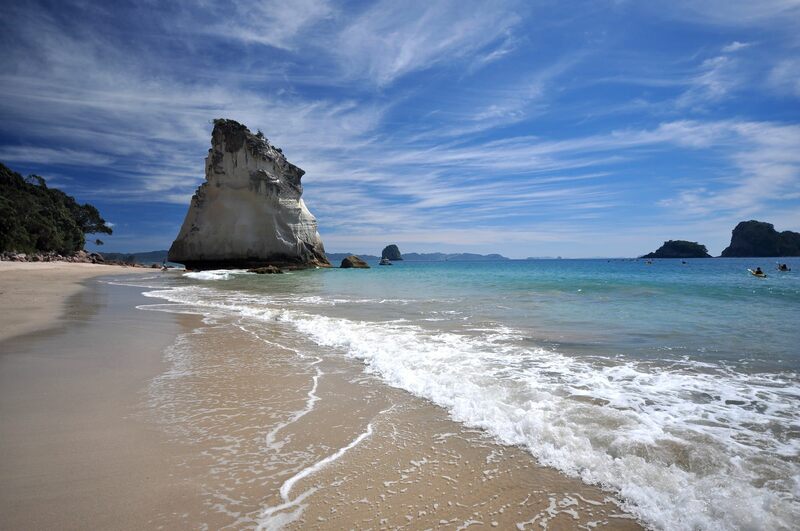 Both coves contain shapely natural rock stacks, Sphinx Rock in Mare's Leg Cove, and Te Hoho Rock in Cathedral Cove. Stingray Bay, and in particular Gemstone Bay, are popular snorkelling and diving areas, as marine life within the reserve boundaries is plentyful. In Gemstone Bay there is also a snorkel trail marked by the Department of Conservation. Both bays are also accessible by paths leading down from the main walking path to Cathedral Cove.